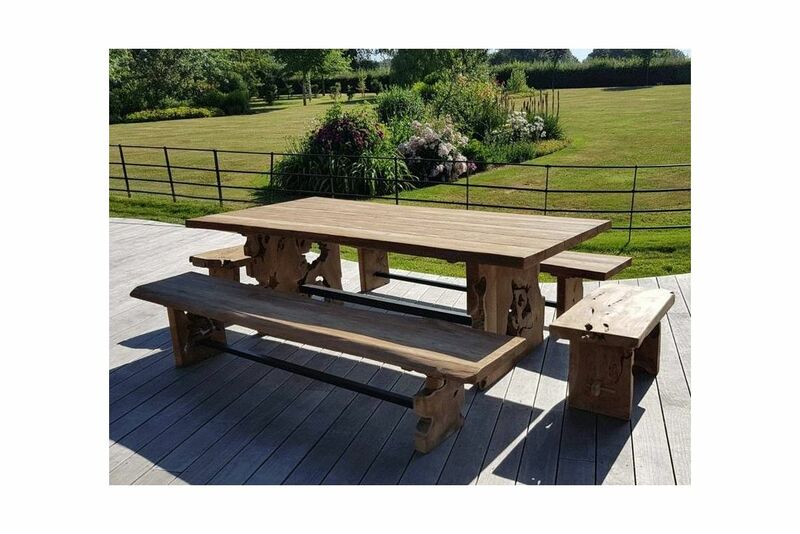 The Nature Teak Bench Set is hugely popular. The table is hand finished in a superb rustic style with a chunky aspect and sturdy finish. The teak is genuinely reconditioned and crafted by hand making each one unique to you. Set includes a 2.4 metre Teak Table and Four Teak Benches. solid strips of teak that run along the table top are reflected in the strips along the benches, another little feature that looks great and enhances the appeal of this bench set as a whole. Solid panels of smoothly finished reclaimed teak root are used to form the legs on both the table and the benches that sit round it. There is certainly room for up to 10 people to dine here. The teak itself is reconditioned to the highest standards and is matured from previous uses making it robust and strong. Mortice and tenon joints are used to secure the various parts and these are reinforced with teak dowels for added strength and long-lasting usability.